At a time when fellow Americans set their sights on working in London, Vanderlyn made the singular decision in 1796 to study art in Paris. His striking portrait of Sampson Wilder (1780-1865), a wealthy Massachusetts merchant, clearly reflects the lessons Vanderlyn absorbed from contact with the work of such great French masters of Neoclassicism as Jacques-Louis David and Jean-Auguste-Dominique Ingres. 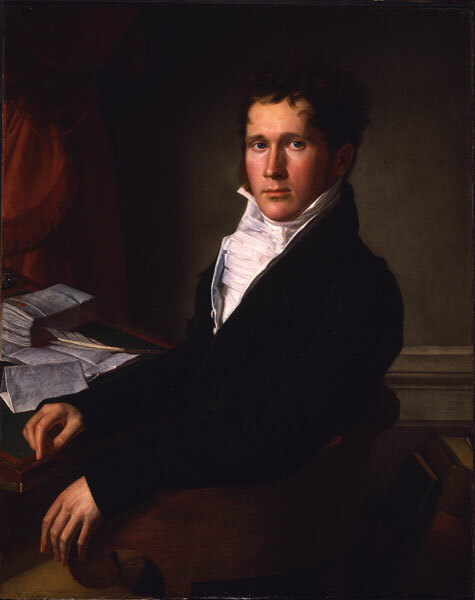 The aloof, self-contained demeanor of the sitter; the strong contour of the figure's sleeve repeated in the curve of the chair; the understated palette of browns, grays and greens; and the smooth surface of the painting, with few traces of brushwork, all are characteristic of the French Neoclassical style of the early nineteenth century. When Vanderlyn painted Wilder, both men were part of a small American community in Paris. Wilder returned to Bolton, Massachusetts, in 1812; twelve years later he hosted the Marquis de Lafayette during a tour of the United States honoring the general's role in the American Revolution. Wilder's portrait, then, stands as an emblem of the contemporary French taste as favored by both artist and sitter.